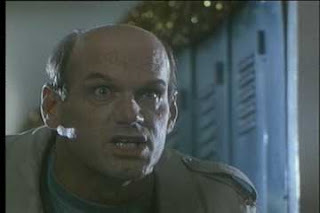 Jesse Ventura, at a point in his career when his nickname was transitioning from “The Body” to “The Mind” and he had yet to go off the rails as a batty conspiracy theorist, plays Abraxas, an 11,862 year old Finder. What’s a Finder you ask? Well, they are the “cops of the universe” - alien beings sent around the galaxy to police things. When the evil Secundas (Thorsen) impregnates Sonia Murray (Bransfield) with a child, Tommy (Mitchell), with the goal of obtaining the “anti-life equation”, Abraxas’ superiors tell him to eliminate them. But Abraxas develops feelings for the woman and boy so he decides to battle Secundas instead. This all occurs in a small “New York” town, Thornbury (actually in Ontario, Canada) patrolled by two cops, one of which has an inexplicable Uzi. Will Abraxas prevail? Or will the world be destroyed? The plot is lifted wholesale from The Terminator (1984), and the bleak direction by director Lee and reminders of American Cyborg: Steel Warrior (1993) are the least of this movie’s problems. Abraxas is a really funny movie, as the two meatheads battle it out for the “Komader” (?) and there are many nonsensical moments and hilarious line readings. The most memorable occurs when Abraxas intones “Run Tommy RUUUUUNNN!” and the disturbing moment when Tommy enters his bedroom only to find, with zero setup, a shirtless Ventura in his bed saying “Want me to read you a story?” All this is overseen by what we called “The Exposition Brothers” - Abraxas’ commanders Hite (Levitan) and Dar (Lee) who stand in one position and explain plot points. Interestingly, James Belushi REPRISES his role as Principal Latimer from The Principal (1987)! According to Imdb, he did this cameo as a favor to his then-wife Bransfield. Wait. He’s supposed to be the same guy? That’s just odd. Despite his brief screen time, his face is featured prominently on the back of the Prism VHS box. Tommy and his fellow kid actors are amusing, Ventura looks ridiculous wearing ill-fitting sweatshirts and World Gym attire as he talks into his bracelet, and the role of Secundas should have been played by Schwarzenegger, but perhaps that would be a bit too on the nose. But did they have to remind viewers of the similarities by hiring a man with a similar accent? Still, this is Thorsen’s crowning achievement, much better than as Darcona in Lee's Fatal Combat (1997). Add to the fact that the whole movie is like a sci-fi version of Maury (“you ARE the father!! 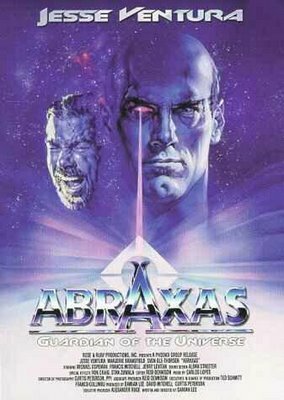 !”) and the fact that Abraxas is not, technically, the “guardian of the universe” as is claimed, and top it all off with some truly cheesy FX, and you have an entertaining night of VHS fun. Silly in every way imaginable, it’s hard to imagine the filmmakers not realizing how funny this was as they were making it. Luckily it’s out there for the world to see so we advise you to check it out. I've been meaning to do this one for a long time, and based on your review, it's as fun as I was hoping it would be. It is definitely silly Ventura fun. His acting is so bad, it's funny. I can't believe The Body's opposition didn't run this when he was running for governor. A missed opportunity by his opposition. If they showed the scenes when Jesse says "Run, Tommy, Run" and the creepy bedtime story scene, he would have lost the election!